This is at the Soo locks. 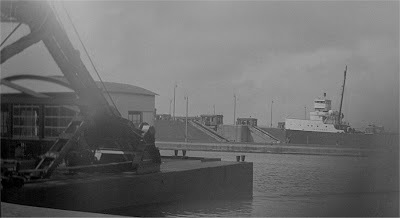 The B.F. Jones is entering the old Poe Lock. If I am looking correctly, it may even be the Davis/Sabin side of the approach wall. If you notice the large crane barge in the foreground, this is where the current Paul Bunyan figure is located. The statue is in a small holding pond docking area for the corps just off the warehouse on the McCarthur Approach wall. This is at the Soo locks, she is entering the old Poe if I am looking correctly, it may even be the Davis/Sabin side of the approach wall, but if you notice the large crane barge in the foreground its where the current Paul Bunyan sits in a small holding pond docking area for the corps just off the warehouse on the McCarthur Approach wall.